Typical habitat in the Llanos of Venezuela, río Apure drainage. 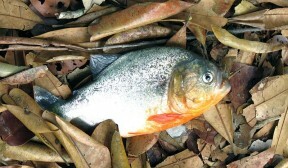 Wild individual from the Río Apure, Venezuela. cariba: from the Venezuelan vernacular word for the fish. Restricted to the Río Orinoco basin in Colombia and Venezuela, including major tributaries such as the ríos Inírida, Guaviare, Meta, Vichada, Tomo, Casanare, Apure, and Guarico. Type locality is ‘Apuré and Orinoco rivers, South America’. Many of its habitats lie within the Venezuelan and Colombian llanos, a vast, highly biodiverse system of tropical savannah grasslands, seasonally-flooded plains and forests covering an area measuring almost 600,000 square kilometers. There are well-defined annual weather patterns with distinct wet and dry seasons and year-round high temperatures. Suitable only for public installations or the very largest private aquaria with an aquarium measuring 240 ∗ 90 ∗ 60 cm or equivalent the minimum requirement for a group. Pygocentrus spp. typically produce a lot of waste so the use of one or more over-sized external filter is essential. If possible buy units with inbuilt heaters or at least fit a sturdy heater-guard as adults have been known to damage submerged equipment. Sump systems also work well and the heater can be housed within. Aim to change 30-50% of the tank volume each week, and exercise extreme care when performing such maintenance or when netting the fish for any reason. The natural diet consists not only of live fishes but also aquatic invertebrates, insects, nuts, seeds and fruits. Each jaw contains a single row of sharp, pointed, triangular teeth which are used like blades to puncture and tear but equally chop and crush. 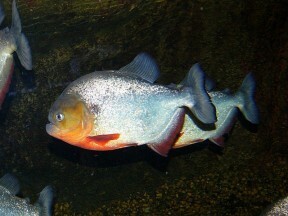 They also attack sick or dying fishes, feed on the fins of larger species, and scavenge carcasses, but assaults on live animals entering the water are very rare and mostly relate to accidental biting or cases in which they have become trapped in small pools during dry periods, i.e., when food is scarce and the fish present in high densities. In the aquarium juveniles can be offered chironomid larvae (bloodworm), small earthworms, chopped prawn, and suchlike while adults will accept strips of fish flesh, whole prawns, mussels, live river shrimp, larger earthworms, etc. This species should not be fed mammalian or avian meat such as beef heart or chicken since some of the lipids contained in these cannot be properly metabolised by the fish and may cause excess fat deposits and even organ degeneration. Similarly, there is no benefit in the use of ‘feeder’ fish such as livebearers or small goldfish which carry with them the risk of parasite or disease introduction and tend not have a high nutritional value unless properly conditioned beforehand. Best-maintained alone although adults tend to leave much smaller fishes alone if well-fed. In very large aquaria similarly-sized species may not be killed outright but their fins are likely to be viewed as food. It is often said that wild P. nattereri hunt in voracious packs, but usually only juveniles group together in numbers. Older individuals exist in loose aggregations and form dominance hierarchies so purchasing a single specimen or group of 5-6+ is recommended, with the latter preferable. Females generally attain a larger adult size than males, and sexually mature individuals exhibit a more-rounded body shape, especially during reproductive periods. Unrecorded, but probably employs a similar reproductive strategy to that of the congener P. nattereri whereby wild populations exhibit two annual reproductive seasons, the first during the rising of the water level at the onset of the wet season, and the second during the low water period during November and December, when there is a sudden temporary increase in water level. 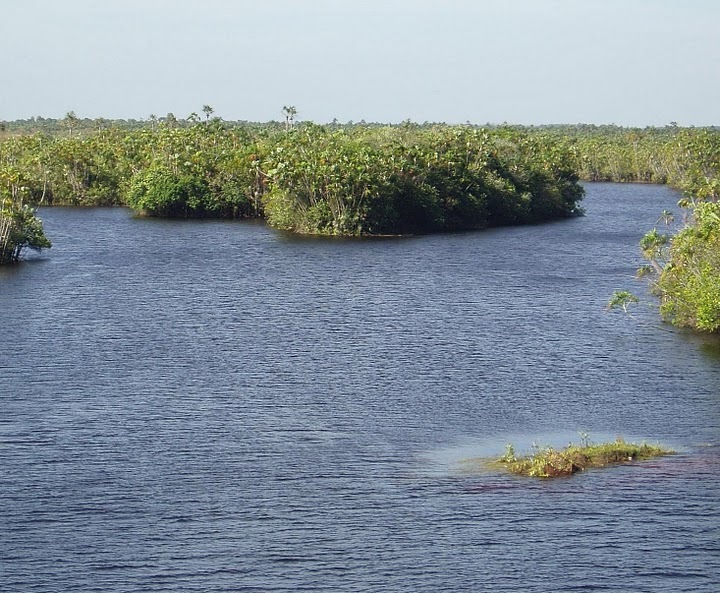 Flooded marginal vegetation and marginal grasses within floodplain lakes are the preferred spawning areas. 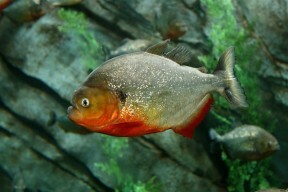 Pygocentrus species are famed as rapacious predators capable of rapidly stripping flesh from bone and a danger to any animal entering its native waters, although little of this infamy is based on factual evidence and there remains not a single record of wild piranhas killing a human being. In taxonomic terms, most modern workers continue to follow the nomenclatural system proposed by Fink (1993) in which there exist three species; Pygocentrus piraya (Cuvier, 1819), P. cariba (Humboldt, 1821), and P. nattereri. While the identities of the first two remain in little doubt, Fink was unable to accurately diagnose P. nattereri, and it remains uncertain whether the species represents a single evolutionary lineage or not. P. palometa Valenciennes 1850 was described from the Río Orinoco and is still listed as valid by some sources and occasionally appears on trade lists, but it is generally regarded as a nomen dubium. Following Fink (1993), P. cariba can be distinguished from congeners by the following combination of characters: adipose fin always without rays (vs. large specimens with adipose rays in P. piraya); humeral spot large in specimens > 100 mm SL (vs. always small or entirely absent in P. nattereri); body with few spots (vs. often with numerous spots in P. nattereri); branched dorsal-fin rays 14-18, usually 15 (vs. 15-18, usually 16, in P. piraya); usually 6 neural spines anterior to first pterygiophore (vs. usually 7 in P. piraya); vertebrae 35-38, usually 36 (vs. 36-39, usually 38 in P. piraya); usually 4 supraneurals (vs. usually 5 in P. nattereri). Recherches sur les poissons fluviatiles de l'Amérique Équinoxiale. In: Voyage de Humboldt et Bonpland, Deuxième partie. Observations de Zoologie et d'Anatomie comparée. Los peces caribes de Venezuela: una aproximación a su estudio taxonómico.